A suicide car bombing at a US military base in eastern Afghanistan killed at least three Afghans and wounded seven others. 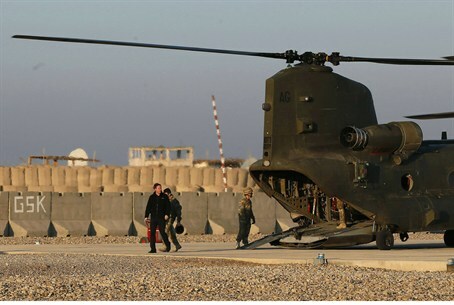 A suicide car bombing at a US military base near a flashpoint city in eastern Afghanistan killed at least three Afghans and and wounded seven others on Wednesday, officials said. The blast, powerful enough to rattle windows four kilometres (two miles) away, took place at the entrance to Forward Operating Base Chapman in Khost. It came two days after an Afghan policewoman shot dead a US NATO adviser inside Kabul police headquarters, the latest "insider" attack by a member of Afghanistan's security forces on their foreign allies, AFP reported. Khost province shares a porous border with Pakistan's tribal belt, which lies outside government control and where US officials say the Taliban and Al-Qaeda have carved out rear bases for operations in Afghanistan. Afghan interior ministry spokesman Sediq Sediqqi said Wednesday's attack was a suicide car bombing. Camp Chapman lies on the edge of Khost city, which has been hit by at least three major suicide attacks this year. "Three Afghan nationals are killed and seven Afghan nationals are wounded. We have no report of coalition casualties right now," said Major Martin O'Donnell, a spokesman for NATO's International Security Assistance Force (ISAF). The Taliban claimed responsibility for the attack. They have waged a bloody insurgency against foreign and Afghan forces since being ousted from power in a 2001 invasion led by the United States. "The attack was carried out by a mujahid named Omar from Khost who knew the area very well," Taliban spokesman Zabihullah Mujahed told AFP by email. He said the attacker "detonated a car bomb while American invading forces were searching visitors going to the base". Abdul Qayoum Baqizai, the Khost provincial police chief, said in a live TV interview that the blast happened at the eastern gates of the base. "One police officer who tried to search the vehicle and two civilians nearby were killed," he said. Khost province borders Pakistan, which is widely believed to be a key source of fighters, funds and supplies for the Taliban. The Haqqani network, a militant group close to Al-Qaeda and blamed for some of the most daring insurgent attacks in Afghanistan, is particularly active in the province. Khost city has been the scene of several bloody attacks this year. In May, a suicide bomber killed 13 at a lunch gathering of police and civilians; in June a bomber on a motorbike rammed an Afghan-NATO patrol, killing 21; and in October another suicide attack on a patrol killed 20. In August 2010 24 Taliban militants, some wearing US uniforms, were killed when they tried to storm Camp Chapman and another nearby US base, Camp Salerno, which was also the target of a suicide truck bombing in June this year. NATO is handing over security duties to Afghan forces as it prepares to withdraw the bulk of its 100,000 troops by 2014, but there are fears the country will descend into civil war when foreign soldiers leave. Efforts to train local forces have been hit this year by dozens of insider attacks by Afghan soldiers and police on their NATO colleagues, known as "green-on-blue" in military jargon. The scale of the insider assaults is unprecedented in modern warfare, and has seriously undermined trust between NATO forces and their Afghan allies.